I’m a Denver native. And by Denver, I mean Denver; my family rarely ventured west and into the mountains. They were dangerous places full of bad weather, sharp turns and the antisocial. We were plains folk. We liked to be able to see people coming. Denver in the 60’s and 70’s was a small but growing city and it had its perks. My parents took full advantage of the many museums, parks and libraries. Sundays were spent, not in church, but at the library downtown or classes at the art museum, natural history museum or the Forney. I was in REI last week, it’s a beautiful building. And these days it’s so clean which is very different from it’s previous incarnations. It was born as the Tramway Power House, built in 1901 to house the boilers and engines to generate the electricity for the Denver Trolley system. When the trolley system went caput in the 1950’s the Forney Museum moved in. 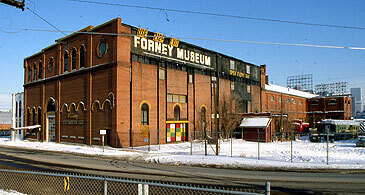 The Forney was (and is) a transportation museum. It’s a collection of cars, horse drawn carriages, trolleys, train cars, motorcycles and bicycles, anything that will get you from A to B. It’s a Colorado museum soup to nuts: the collection originated with Mr. Forney, who started modestly with his own cars and eventually traded tools for unused and unloved vehicles until he found himself with a collection that needed housing. It’s first stop was the then *new and glamorous* Cinderella City for two years before settling in Platte and 15th. This was a grand and dusty place to visit. The building dwarfed the vehicles. Inside the place offered independence from parents; a kid could wander alone up and down the cars, it seemed to go on forever. In the yard there were train cars you could climb on and cars you could sit in. The weeds were knee high. The place had the feeling of being an underdog. I bought a conductors cap when I was seven and wore it for a year. 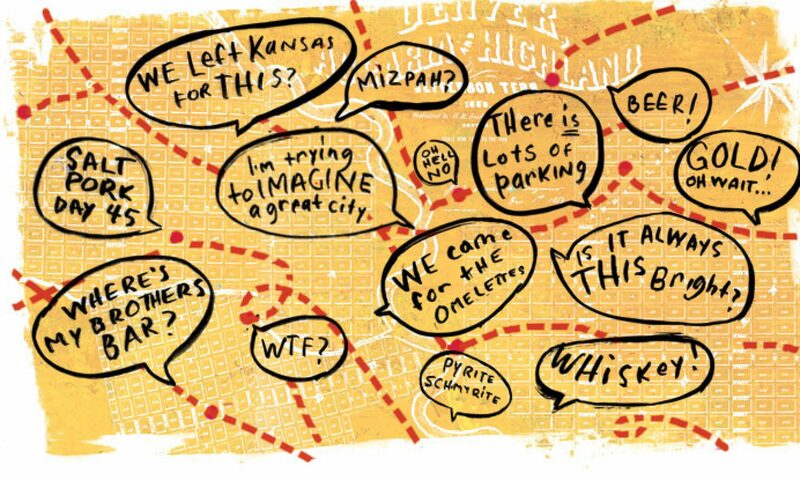 By my teens I had become immersed in the suburbs and school and downtown was lost to me. All these places that had been second homes fell away in favor of Houlihan’s, Skate City, and parks filled with kegs and kids. I left for college in 1982 and returned to Denver in ‘87. In 1989 I moved into the Highlands and the Forney became my neighbor. I also worked as a waitress at My Brother’s Bar, a close companion to the Tramway Building for over 100 years. I became reacquainted with the museum. My newly minted art school sensibilities—so observant and superior—were numbed by visits to the Forney. It was so earnest, so beautiful, and without irony. You couldn’t take a bad photograph in there. There were pigeons roosting that came and went through the high broken windows, and dusty paths of light that created a cathedral effect. It felt like yours too, a still hidden gem no one had claimed. Best of all, in my absence they had added a wax figure diorama of Alfred Packer. In the 1960’s the Boys Club of Denver had the idea that a wax museum was what Denver needed. And they delivered. From a 1964 catalogue of the collection they offer the opportunity to “live with national and western personalities during their moments of greatness.” It was located in today’s golden triangle, just off Speer and 10th Ave. Dioramas of a dead Custer pierced with arrows laying on a pile of soldiers, a triumphant Charles Lindbergh and a raft of survivors from a WWII plane crash were among over 43 tableaus. When the wax museum gave up the ghost in the late 70’s, the owner’s threatened to separate the collection; to keep them all together the Forney bought them. In the mid 1990’s the Forney could no longer sustain the expense of the crumbling historic structure and plans were made to move. I visited Alfred one more time and saw that things were a little willy-nilly; a gnawed limb had been hung in a neighboring shrub like an ornament, the skeletons were cast around him a little too cartoony and ghastly, he’d lost some dignity. It looked like it was time to go. It took a couple years to move everything to the new location at 43rd and Brighton Blvd, a rehabbed warehouse across from the Denver Coliseum. The romance of the collection is still there; it’s just a more well-lit version of it’s previous self. Though Alfred and the dioramas are in storage, a number of the original wax characters are still on view among their companion cars and trains. Still, it would be nice to see a few more of them on display; perhaps staging the prone Custer between the French taxi cab and the little blue Citroen? The possibilities for creating new narratives is intriguing. The museum is available to rent for parties and events. I’d love to be there after dark; left to wander around the cars and trains, ducking to peer in the windows of the cars to see who may be inside. And all the while looking for the basement. This entry was a great Christmas present. I remember your talking about the Packer diorama once and of course it seized my imagination, too. No kidding, I spent an hour or two late one night googling, to see if I could find a visual of it somewhere on the Web. Nada. But now I have one, thanks to you. It’s as creepy and wonderful as you described. Thanks so much! I never got to go down to Denver to see the wax museum, but I saw pictures of it, and the Packer diorama chilled my grade-school spine. I did see one souvenir of him in the old Pioneer Museum in Fort Collins: a walking stick he made in prison, before the Denver Post succeeded in getting him paroled in his old age. That used to be a great museum in its cramped little old WPA building. When they built the new library, it was moved into the old Carnegie library building. With a lot more space, the place was ruined — the new philosophy of museums is like nouvelle cuisine: a bare white plate with a miniscule cut of meat and a leaf on top; or, in the case of the museum, a large display case with a tiny object centered inside. Like the air around it is something worthy of contemplation. Most of the collection is hidden away somewhere. I’d pay money to go look there. Loved the Forney. Still remember the half-a-plane in the basement, the weird cars with flat tires, on and on. I’m glad they didn’t flatten the building, but I still miss the way it was. On the subject of the Pioneer Museum in F.C., miss that too! Still remember the stuffed one-eyed dog they had. Eeek!